Recent media focus on US government shutdowns and on quirky turns in investigations into Russian meddling in Trump’s 2016 election leading to a demand for his impeachment have obscured an important new trend that is heralding a new era with deeper implications for US politics and even for the rest of the world. Thanks partly to Hillary Clinton becoming the first woman to win the Democratic Party’s ticket to contest the 2016 Presidential elections, perhaps encouraged by Trump’s misogynist image and by the general process of women’s empowerment, there are half a dozen women candidates today seeking the Democratic Party’s nomination to defeat Donald Trump in the Presidential election next year. No doubt another half a dozen women had contested Presidential elections since the 1940s but they represented unknown political outfits and were never seen as serious contenders. Likewise, though there were few women candidates who sought nominations in these two major political parties — Republicans and Democrats — they never managed to win nominations of their party. Even in the 2008 primaries of the Democratic Party people preferred their first Afro-American Barack Obama over White Hillary Clinton. This piecemeal progression has now resulted in a sudden and unprecedented explosion of women candidates and of women amongst their managers and supporters that seem pregnant with possibilities of finally rectifying this gender bias in U.S. politics. What will make South Asians especially interested in this unfolding saga is that two frontrunners amongst these five named women candidates — Tulsi Gabbard and Kamala Harris — share close and direct connections with South Asia’s Hindu and Tamil communities. Amongst a few other candidates these are also seen to represent minorities, immigrants, youth and, of course, women, which all have been on the receiving end of Trump policies and tweets. Given that about four million South Asians live in the U.S., each of these episodes have already built some following amongst various South Asian media houses. Kamala Harris — a first term, first South-Asian-origin Senator from California — announced her candidacy on 21st January, the 90th birthday of Rev. Martin Luther King Jr. His birthday is not just one of the rare national holidays in U.S. but King Jr had shown great interest in the liberation struggles of South Asian people and was greatly inspired by Mahatma Gandhi. 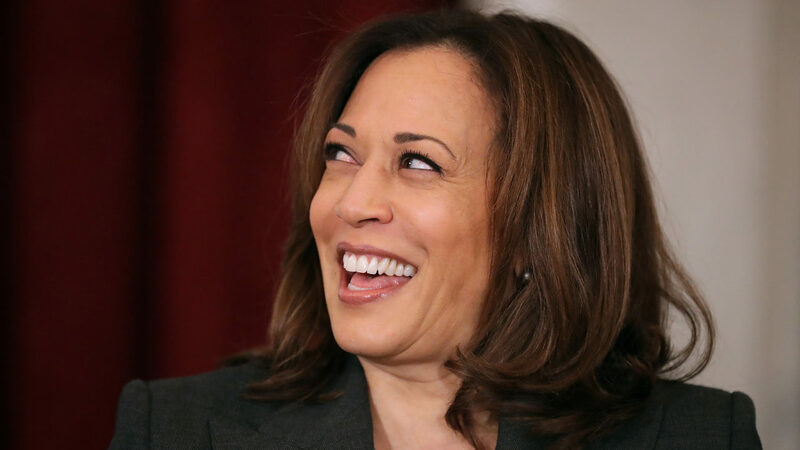 Second, Kamla Harris shares a rather close working relationship with senior leader Hillary Clinton who again — as first lady and later as Secretary of State — shared a close personal relationship with most South Asian leaders. This Sunday, as Kamala Harris kick-started her campaign with her first rally in her hometown Oakland, several top team leaders of her campaign committee come from the Clinton team of 2016. These include women like her national finance director, Angelique Cannon, her spokeswoman, Lily Adams, and her sister Maya Harris who is the Chair of her campaign committee as also men like senior political advisor, David Huynh, lawyer and veteran campaign finance manager, Marc Elias. All of them had been in the Clinton team of 2016 and have surely learnt lessons. Rohini Kosolgu is the name that stands out for South Asians. 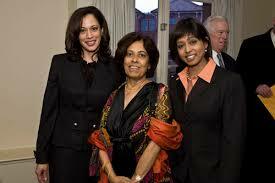 Kamala Harris last month promoted this first generation young Tamil immigrant from Sri Lanka, as her Chief of Staff. Ms Kosolgu has been her long term associate and was till recently her deputy chief of staff. Indeed, Kamala Harris openly celebrates her strong Tamil connections. Her recently published book The Truths We Hold: An American Journey details her family connections and home visits. Indeed, her explorations about seeking nomination had begun last month with her book tour across the United States. The book talks of her mother, Shyamala Gopalan as her ‘superhero’ and her grandparents Rajam and P.V. Gopalan responsible for her sense of responsibility and passion in using politics as her platform for social reform. P.V. Gopalan was a freedom fighter who after independence of India was posted to Zambia. His daughter Shyamala, came to U.S. for higher education where she married an African American, David Harris from Jamaica from whom she had two daughters — Kamala and Maya. But this African-American leader continues to be known more as South Asian. 37-year old Tulsi Gabbard is a member of the House of Representatives. This is the fourth time she has won her seat from Hawaii and she currently sits on the House Armed Forces and Foreign Affairs Committees. Her mother had been member of worldwide Krishna Movement and at an early age had converted to Brahma Madhva Gaudiya community. So Carol and Mike Gabbard bought up all their five children — Bhakti, Jai, Aryan, Tulsi and Vrindavan — according to strict Hindu traditions. No doubt in 2013, Tulsi Gabbard made history in taking oath on the Bhagwat Gita declaring herself as the first Hindu-member of U.S. Congress. Tulsi Gabbard is known for having a close rapport with the Indian Prime Minister Narendra Modi, who had hosted her in India in January 2015. At her wedding ceremony in April 2015, India was represented by Ram Madhav, one of the most visible General Secretaries of the ruling Bhartiya Janata Party (BJP) , who carried message and a gift from Indian prime minister. What all this means for South Asians living in US and elsewhere? At the least, there is no denying that the U.S. President’s policies have a direct bearing on much of the world and the world has become increasingly interconnected and interdependent. Being the world’s largest economy — twice the size of China’s which comes second — and most powerful military-industrial-complex, the U.S. is the only country that uses its domestic legislation to punish other nations and their leaders. Partly because of this, there is a view that the whole world should have some kind of a say in who is elected as U.S. president. Indirectly, of course, several nations are known to use funding and other means to influence U.S. presidential elections. That is why the Russian-connection of Donald Trump has triggered such an uproar. Lobbying is another well institutionalized form where major nations seek to influence policy making in the U.S. Congress. So, is this not time for South Asians to think ahead and calibrate their support for promoting certain candidates with South Asian connections? Starting with Sirimavo Bandaranaike to Indira Gandhi, Benazir Bhutto to Sheikh Hasina, South Asian have given the world a string of great political leaders. This should make South Asians promote women candidates in the U.S. Presidential election especially if they have a close and direct connection with this region. It may take pulling all stops to ensure that one-day a women President may be finally sitting in the oval office!